Blu, Jewel and all their friends are back on the big screen on April 11, 2014. If you're like many Kansas City families, you're excited for this family friendly flick. We're thrilled to bring you an exciting giveaway so keep reading to find out more. You can also check out the official synopsis and trailer below. 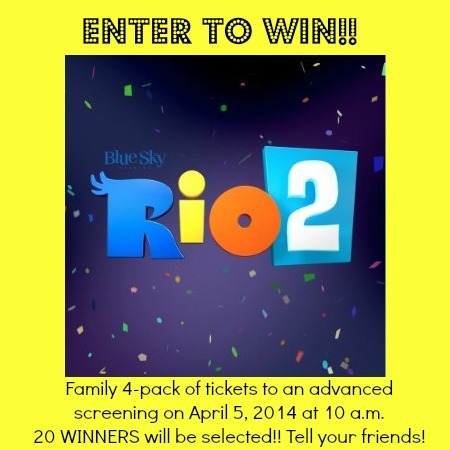 Enter to WIN a family 4-pack of tickets to an advanced screening of the new Rio 2 movie taking place on April 5, 2014 at 10 a.m. in Merriam, Kansas. We've got enough to give away to 20 different winners so be sure and share this giveaway with your friends! Ready to enter? First, leave us a comment here telling us why you want to win. Then, just visit this page to be automatically entered! 20 winners will be notified on April 2nd. Good luck! Would love to win because my kids loved the first Rio movie. My boys want to see this movie. Would love to see this with the kids. My boys love the first Rio, especially my almost 3 year old and this would be a perfect opportunity to take him to his first movie theater experience! I think our little guy is ready to see his very first movie in the theater with mom and dad! He would love this movie! We would love to win these tickets!! My kiddos love going to the theaters and they looooved the first Rio. I would love to see Rio 2. I know my girls are going to just love this movie!! I know my girls would have a great time! I would love to win these tickets because I have been wanting to take my two year old to his first movie! My boys would LOVE to see the movie!!! My son is just a bit obsessed with Rio. ;) He would love the chance to go see Rio 2. Would love to take my son to this if there are still tickets.